Pay as much attention to the quality of the materials used in the framing process as the attention you use to choose your frame. Choose a glass or plexi-glass (plastic) covering for your artwork that has an ultra-violet filter. This will help to keep your artwork from fading. All mats that come in contact with your artwork should be acid-free; preferably made from cotton. This will eliminate the acid found in regular wood pulp mats and prevent that ‘burn’ (brown) line found on art over the years. It is better not to place glass directly on the art. It causes the art to heat up (dry and crack). Your art needs a little air space to breathe. With pastel, chalk or charcoal, this is especially true. The static field of the glass will pull any loose chalk from the surface of the art and stick it to the inside of the glass…causing the glass to look foggy. Your art should be placed on acid-free foamcore and/ or matting. This will eliminate the acid burn (discoloration) that comes from using cardboard or wood backing. It will keep your art fresh. If you have a stretched canvas piece (original or giclee), make sure the chosen frame is deep enough to cover the stretcher bars. It looks unfinished to see part of a painting poking out the back of your frame. When working with many different objects for a shadow box, make sure to measure your highest object to determine the frame depth. Many deep frames are unfinished on the inside and may require a mat covering for a more finished look. The width of a frame should be strong enough to support the size of the artwork. A ½” wide frame would not be a safe support for a 3’ x 3’ piece. The bigger the piece, the wider the frame should be. Living so close to the ocean, the wire used to hang your art should be plastic coated. With time and moisture, regular braided wire will rust and break. That ‘big’ earthquake is always coming. Use 2 hooks, as far away from center, to secure your frame to the wall. On 1 hook, the art is usually knocked off the wall on the first rumble. 2 hooks keep the art to the wall. If you’re willing to organize a little and put in some time, you can use a readymade frame with success!! 1. MEASURE the artwork …Decide if the whole thing is to be framed (as in a poster), or if you only want the image to show with a mat (as in a photo that is not exactly 8”x 10” because it has a white border). 2. WRITE it down..Carry this with you when you go shopping so you can pick from the standard size readymade frames available. Most ready made frames come with glass and a mat. Some typical sizes:8”x10”, 81/2”x11” (common diploma/certificate size), 11” x 14”, 16” x 20”, 20” x 24”, 24” x 30” (common poster size). 3. CHOOSE a slightly bigger frame than your artwork. See if the mat provided will work with the opening you need. For example: an 8” x 10” photo will work well in an 11” x 14” frame. 4. Have a CUSTOM MAT cut to fit your art and frame, if the ready made mat does not work. For a few dollars more, everything looks balanced. Ready made frame + custom mat. 5. If you are FRAMING A SERIES of individual family photos, pick one color (black, natural wood tone, silver or gold) and then vary the design of each frame. You will have a group setting by having them all in the same color. The visual interest will be piqued by the variety of each frame design! 6. CHECK the store’s website for coupons or sales, before you shop. Aaron Brothers has gained fame for it s 2 for 1 sale and Michael’s Craft Store or Craft Essentials may have a sale going on! If you've ever been to the shop you may have noticed a tiny garden planted in the parkway. 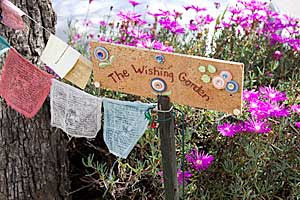 This is not just an ordinary garden but a 'wishing garden'. You are welcome to place your wish into the garden, who knows, it might just come true.